Baseball is the most popular game in United States and it has been picked up in many countries where US has managed to put its military weight for some reason or the other. History says that United States has used its military force in several of its neighboring southern countries that include the names like Dominican Republic, Cuba, Panama and Nicaragua. Why exactly America used it military forces in these countries is sometimes controversial but the truth is that they did. 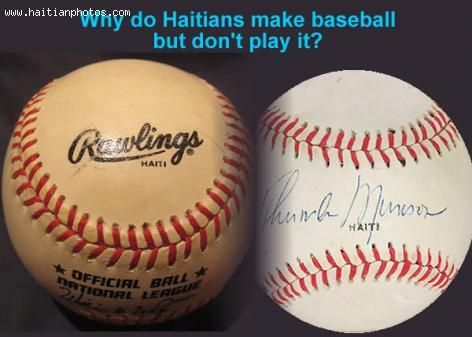 Haiti is the only country occupied by US that does not play baseball. Haiti is not aloof. US forces invaded Haiti. The US occupation continued from 1915 to 1934. Whatever be the cause behind this invasion, it turned out that the Haitians did not like American soldiers invading their soil. As far as the statistics speak, the American troops killed more than 2,600 Haitians, good or bad. This definitely did not leave a good image of America on Haitians. It is natural that Haitians did not love watching US Marines playing baseball! Participation was a far cry! Apart from the US occupation during the early 1900's, America has time and again intervened in Haiti and 2004, US led allied forces (including Canadian and French forces) spearheaded the overthrowing of Haiti's first democratically elected government. Today, even though Haiti thrives on international aid including American funding on several fronts, the scars left by American armed forces prevent Haitians from playing baseball and instead, they prefer soccer as their favorite game. VERY TRUE. BUT HAITI WAS THE ONLY "TOTALY BLACK POPULATION COUNTRY" OCCUPIED ON THOSES DAYS BY THE US AND THE MARINES WERE ALL WHITE. HISTORIANS SHOULD INVESTIGATE THIS WAY.